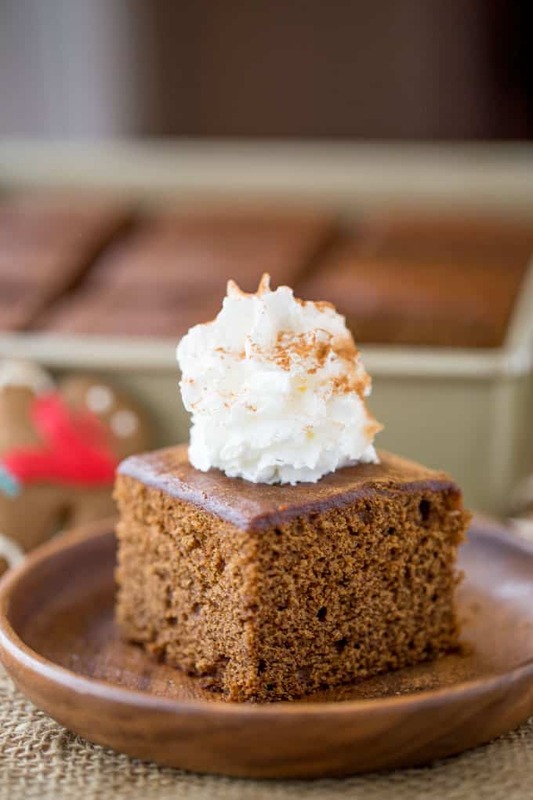 Classic Gingerbread Cake with a rich molasses, cinnamon and ginger flavor is fuss free and the perfect holiday breakfast. Also works great as part of your dessert table. 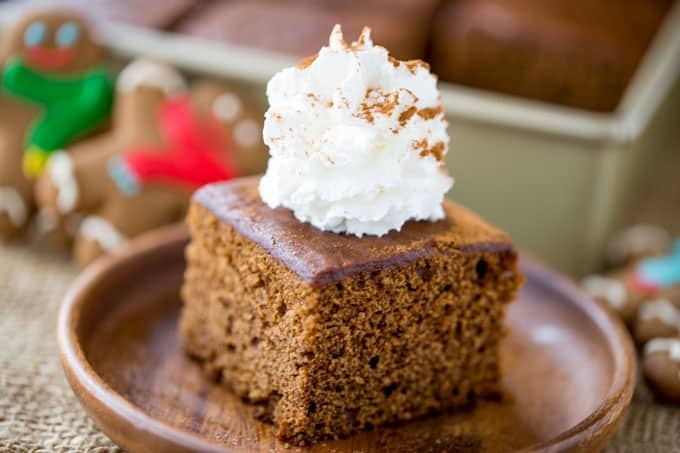 Classic Gingerbread Cake is the epitome of the Christmas season and the perfect breakfast cake with your morning cup of coffee. When I was younger and loved getting holiday drinks from Starbucks I used to love the gingerbread loaf they would sell and I would buy a slice without fail. 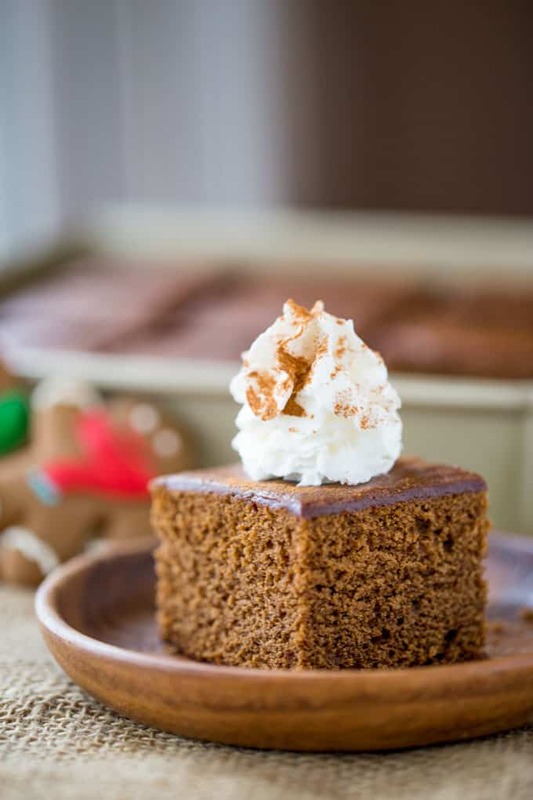 This Classic Gingerbread Cake is like the Gingerbread loaf from Starbucks without the icing and it is the perfect slice of cake for your morning coffee or for easy holiday office treats. The flavors are strong, sweet, slightly spicy from the ginger and scream holidays. This post is going to be the last one until after Christmas but I will be back next week with more delicious recipes, so I hope you all have a happy, family filled weekend whether you celebrate Christmas, Hanukkah or whether you’re just enjoying a quiet long weekend at home (hopefully with an extra day off work!). We’re celebrating Chrismakkuh here, so the kids are going to be swimming in presents, latkes, all things Christmas and lots of Gingerbread Cookies and Gingerbread Pancakes with Cinnamon Syrup. If you’d like to learn the history of Chrismakkuh look at this Seth Cohen video from the OC. 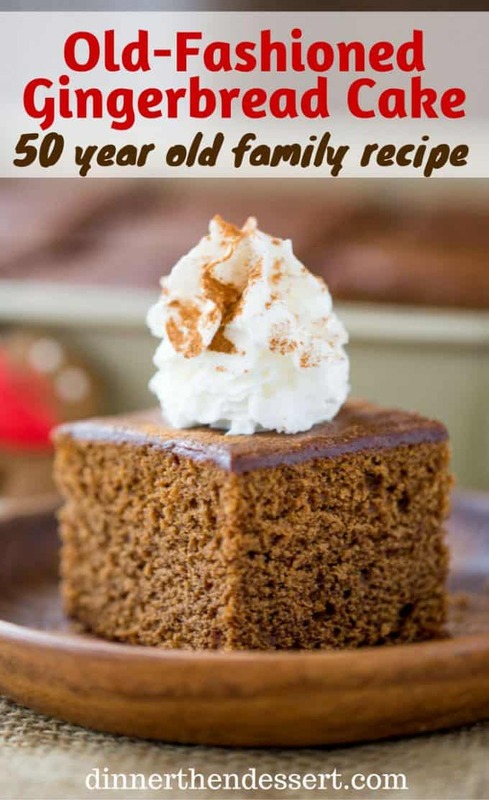 My family is a huge fan of all things Gingerbread, so along with the Award Winning Cookies recipe I was given, this recipe is an old family recipe over 50 years old that I’d never actually tried before. Go figure the treasures you find when you ask for it, I made the cake immediately and it was heaven on earth. My original recipe shows the whole recipe written out and an added footnote to the bottom that looks like applesauce was added in at a later date. So hey, recipe testing over the years! 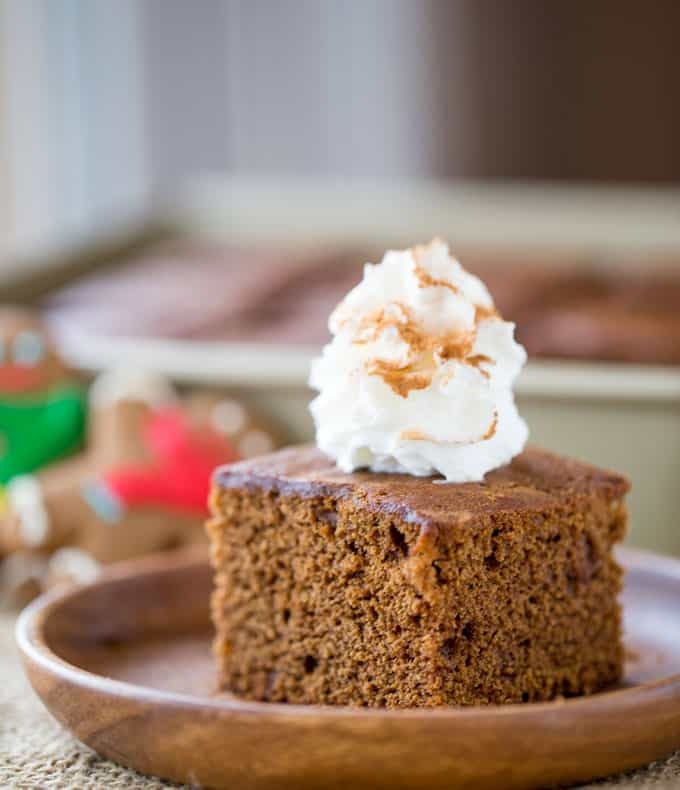 This Classic Gingerbread Cake has been recipe tested over the years and is ready for your holiday table. Happy Holidays everyone, thank you for an AWESOME year and next week will have a couple of recipes and some of the year end superlatives I love to revisit. Baking Pan: Love this baking pan for the perfectly angled sides that allow the cake to cook and rise evenly and high against the sides of the pan. 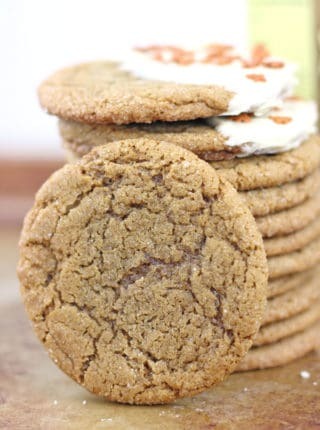 Unsulphured Molasses: There are many kinds of molasses, the kind used in this recipe is unsulphured which is my molasses recommendation in all gingerbread baking. I use Grandma’s because it is most widely available, but I also love Brer Rabbit brand in the mild flavor when I can find it. Applesauce: Any applesauce will work here, but we all love Musselman’s because its a brand that has been around over 60 years, all the apples are grown in the US and the only added ingredient is absorbic acid and the flavor is fantastic. That being said… I have definitely used one of the kids applesauce pouches in a pinch too, haha. Butter and flour or use baking spray with a 9 inch square pan. In a stand mixer, cream together the sugar and butter until lightened in color and fluffy. Beat in the egg, and mix in the molasses until fully combined. Add in the flour, baking soda, salt, cinnamon, ginger, and cloves until just combined. 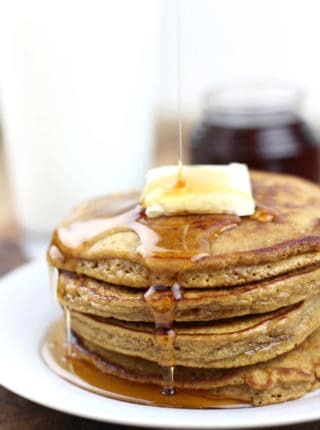 With a whisk, add in the hot water and applesauce (using the stand mixer would make a mess with the water and pouring in the water slowly would cause the flour to over-mix). I followed the directions exactly and the molasses flavour is way too overpowering. Yuck! I’m disappointed and it irks me when I feel that I’ve wasted ingredients and my time. Also, my cake turned out a lot darker than the picture that’s shown here so something doesn’t match up. Next time I’ll put less than half the molasses that is called for and I’ll up the apple sauce because I love the apple flavour and I dislike detectable amounts of molasses in my baked goods. Followed the directions exactly (using apple sauce) and it turned out great! Just the right amount of spice – not too strong. Thank you for sharing this, I will be making it again for a pot luck this weekend. So glad you enjoyed it, Tom! Thanks for the 5 stars. Hi the cake smells really good, after 43 minutes it’s still kinda wet in the middle, I’m going to bake it for 10 minutes and see what happens!! When done, is the cake able to be inverted from the pan, or does it have to be cut and served in it? I have cut around the edges and inverted out, it would depend on the non-stick nature of your pan. If you want to invert out be sure to grease and flour your pan well. Can I make this a couple of days ahead of shen I’m serving it? 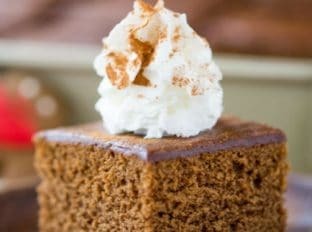 I tried your “Classic Gingerbread Cake” and absolutely love it!!! I did NOT use the applesauce and it is so light and fluffy! The flavor of the spices is perfect! I wish I lived in Sacramento! Well, I just had some of this cake. It is AMAZING. I modified it only slightly: added 1/4Cup chopped candied ginger and 2 Tablespoons grated fresh ginger. In place of applesauce I used 1/2 cup of brandied dried mincemeat. The mincemeat has been marinating in brandy for about 3 days. But I followed the recipe for ratios of flour, butter molasses (what a lot!) and rest of the spices, and water exactly. This has the most amazing delicate crumb. Featherlight, etherial, delectable. Thank you so much. Happy holidays! Love your modifications! Sounds amazing! I thought this cake had a heavy molasses taste, mellowed on day 2. Others really liked it.Don’t know if I would make it again. 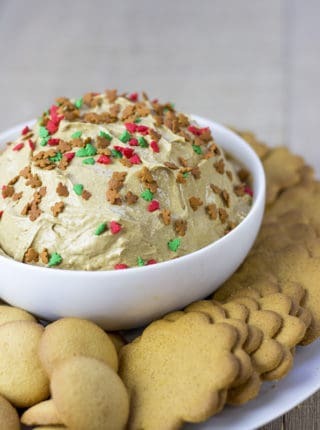 I just finally got around to trying this tonight and not only was it super easy, but it was so delicious and exactly what I wanted in a gingerbread! 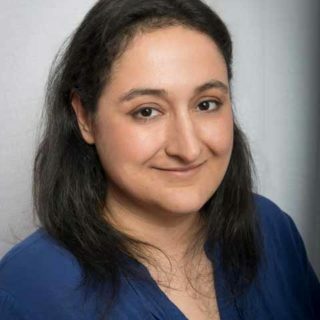 So glad you enjoyed it, Joanna! Thanks for the 5 stars. Do you have any feedback if I want double the recipe and cook in a 9×13 pan? Same baking time or increase it? Thanks! That’ll work perfectly. You may need 5-10 more minutes of bake time but just check it 40 minutes and then every 5 minutes from there to be sure. Enjoy! If I don’t have a stand mixer, will a hand mixer work? 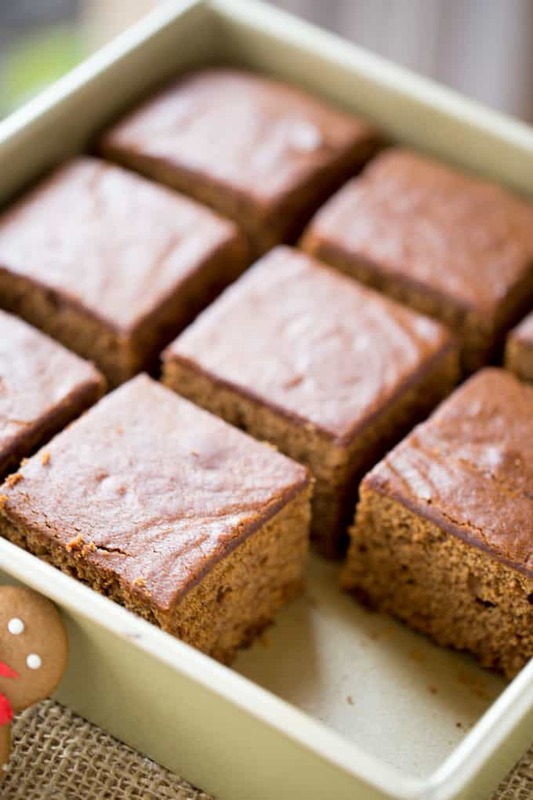 Just wondering if you made this in the cupcake tin that is shown when you click on “baking pan”, or in a loaf pan or square pan as shown in the slice pictured?? (Baking times would be different). The baking time stated sounds more like a loaf pan or 8″ square pan? The picture looks like it was from the latter. Can’t wait to try it though! So this recipe only makes one small pan? I need to make (3) 8″ layers with mascarpone cheese icing. So I would just double or what? Please tell me what icening you use and the recipe? I didn’t use any icing for this recipe. I made this recipe and it turned out really good! I just sprinkled Cinnamon sugar on top. The cake is flavorful, moist and dense but not a sign dense as pound cake. We went to the Pomona Fair last September, looking SO forward to the gingerbread house that makes THE best gingerbread. As a lot of things from my childhood, it was no longer a part of the county fair! 🙁 I have been thinking about that darn cake since then and it is now almost Christmas! Going through Pinterest and this recipe is exactly like my mom’s recipe that she always used, but I had been unable to find. This is just lovely…..I have it baking right now and am SO excited to present it for dessert tonight! I’m so sorry that it’s no longer there but glad to give you a little joy here 🙂 I hope you all enjoyed it! Old family recipes are the best… they are always a hit at parties! 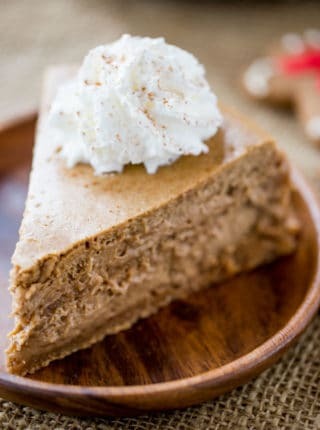 This is such a perfect holiday dessert! I love gingerbread, this looks great! 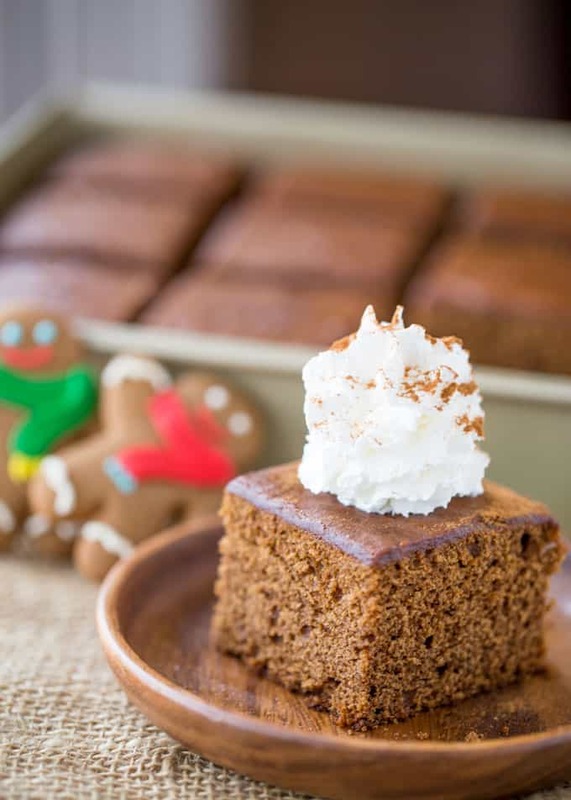 This gingerbread cake is perfect for the holidays! !